All of the Chemex pour-over flavor you love, none of the hassle. 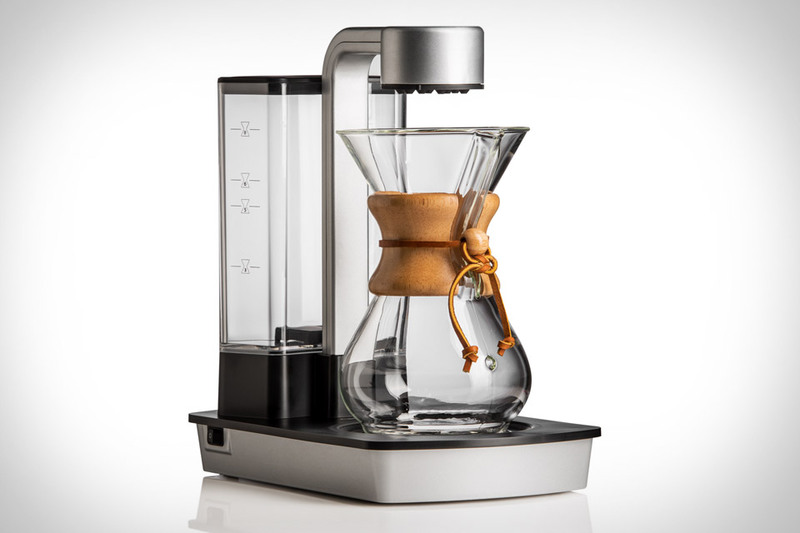 The Chemex Ottomatic Coffeemaker is a clever way to simplify your morning coffee routine. This smart brewer automatically manages variables like water temperature — it keeps it at the common specialty coffee range of 197º-205ºF — contact time of the water to the coffee, and the temperature at which the coffee stays after it's brewed. It also features a unique sprayhead that offers staged brewing cycles and ensures a fully wet bed of coffee, as well as a glass Chemex carafe and a two-tone silver and black body. Brewing from the bottom up using nothing but heat and steam pressure, the moka pot makes an incredible cup of coffee. Unfortunately, very few available today are capable of fulfilling its potential. Hence the Blue Bottle Moka Pot. Developed in collaboration with industrial designer Joey Roth, this modern take on the classic brewing method features a steel water chamber that distributes heat evenly, a separate steel middle chamber for the grounds that features an integrated cork handle, and a white ceramic serving chamber on the top. Simply fill the bottom with water, load the center with grounds, set it on the stove, and get ready to enjoy come fantastic coffee. It might be tempting to break out the old Christmas Nutcracker as the holidays are in full swing, but the Nut Hammer from Menu is what you should reach for. It's a nutcracker with a soft silicone head that fits over the top of a hammer-like object. Just place a nut in the silicone holder, hit the hammer against a hard surface, and the job is done. Simple, well thought out design that will have you snacking in no time. Odds are you already have a water filter. And odds are it isn't half as striking as the Soma Black. This limited edition product consists of a shatter-resistant glass carafe, a custom black reservoir, and a plant-based filter that's good for at least 40 gallons of water. Fresh filters will be delivered every 60 days, and proceeds from your purchase go to supply clean drinking water for a person in Cambodia. 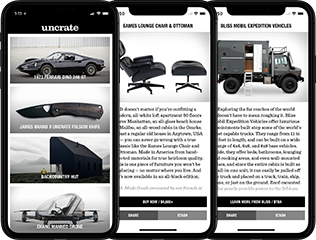 And as extra motivation, each one arrives with a code you can redeem for a gift that's randomly selected from their well-curated list, meaning your water filter could come with anything from a set of coasters to a fiberglass Eames chair. Of all the things in our kitchens that we'd like to be automated, the coffee pot is at the top of the list. The Mr. Coffee Wemo Smart Coffeemaker gets us one step closer. Thanks to built-in Wi-Fi and compatibility with the WeMo system of connected gadgets, this smart machine lets you start your morning pot of coffee brewing from the comfort of your bed, or setup a schedule so it starts automatically and only bothers you when the coffee's ready. Optimal brew technology heats water to 205º for optimal flavor and a brew time of under eight minutes, a 10-cup thermal carafe keeps everything hot and fresh, but unfortunately, you still have to fill it with water and replace the grounds and filter manually. The one deterrent to preparing a cold, delicious bowl of ice cream is the complication of actually scooping the rock hard dessert. Midnight Scoop is on the case, and has an interesting take on this simple yet annoying issue. The ergonomically shaped curve of the handle lets you push with your palms, causing the stronger muscles of your arms and chest to do the work in the place of the weaker ones in your wrist. No more waiting for ice cream to thaw or bending spoons — and your patience. Unless you have an unlimited amount of cabinet space, odds are your cookware spends quite a bit of time out where guests can see it. Make sure it looks as good as possible with Iittala Tools Cookware. Designed by Björn Dahlström, this versatile, stylish set of pots and pans is suitable for induction, gas, electric, and ceramic ranges, can go straight from the oven to the table, and is made from sturdy stainless steel to ensure that it lasts for many, many meals.